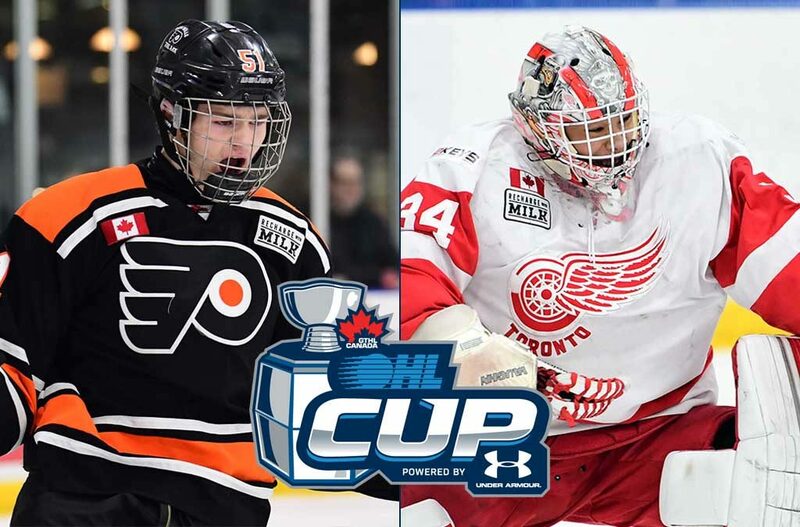 The 2019 OHL Cup Showcase Tournament powered by Under Armour and hosted by the Greater Toronto Hockey League, is down to two teams as the GTHL’s Don Mills Flyers and Toronto Red Wings emerged victorious following this morning’s Quarter-Finals and this evening’s Semi-Final contests. A hat-trick from exceptional status OHL Priority Selection prospect Shane Wright powered the Flyers (6-0-0) into their first OHL Cup Championship Final since 2015 following a commanding 7-1 win over the Detroit Little Caesars. Don Mills began the day by locking down their third straight shutout in a 5-0 blanking of TPH Hockey in quarter-final play. The Toronto Red Wings (5-1-0) advance to their first OHL Cup Championship Final since 2006 thanks to a pair of third period goals from 2004-born winger Adam Fantilli. The Red Wings got the better of the GTHL rival Mississauga Rebels in a 4-2 decision as captain Francesco Pinelli picked up a pair of assists. The Wings started the day with a 5-0 quarter-final shutout of the Quinte Red Devils. Monday’s Championship Final features two GTHL teams ranked inside the weekly OHL Cup Powered by Under Armour Top 10 Rankings. The top ranked Flyers battle the seventh ranked Red Wings in a rematch of their GTHL semi-final series that saw Don Mills take an 8-2 (pts.) series victory. Be sure to catch all the action live from the Mattamy Athletic Centre on Sportsnet Ontario at 7:00pm.